Here are Rich and Jack's take on Cuphead! Spoiler alert, it's beautiful but the game play doesn't blow you away. Throw your hat, land it on someone/something else, become that person/thing. This is an insane new mechanic. I'd love to find out more about this story line. Has Mario been a zombie of the hat through all the past games?!? The music sounds incredible. I'm hoping the actual game has a soundtrack like this! Anyone else completely confused by this trailer? This game looks like total insanity. I'm so incredibly confused and intrigued. I felt bad for the frog. That's a fantastic song from Katamari! It does look like an interesting new direction for Mario, for sure :D.
I agree, the music sounded cool and relevant to the game, and the mechanics looked cool, too. It reminds me of Mario N64, Sunshine, and Galaxy. This is a great trailer. It teases plot points without giving anything away. And plus it's new Star Wars!!! Yep, this trailer was really cool and I am excited for The Last Jedi even more now. If Disney keeps going at this pace and with the movies as good as they have been I think I'll be watching them excitedly for quite some time. Adam, that may be true about the Han Solo movie, I'll hold judgment until a trailer at least. I finally have a couple things to say about this trailer so hold on to your butts. Sorry that wasn't a Star Wars reference. Firstly I want to step back a bit and say I think the Force Awakens is getting a but too much negativity amongst some fans. The fact that it was made as quickly and was as good and made as many people happy and again, was good is a miracle. I think the Movies With Mikey review sums it up well even though Mikey does tend to get a bit gushy the end of his reviews. Regardless, Force Awakens was a movie I still stand by as "liquid joy" and one of the more magical theater going experiences i've had lately. Until I saw Arrival then that topped it, but Force Awakens was superb and as a fan very satisfying. I could get into the biggest criticisms of it, but I won't because we've talked about that before. All that to say, my guess is Last Jedi will be incredible and in many ways better than the Force Awakens because the Force Awakens built up so much The Last Jedi can now pay off and kick the world building and incredible parts of Star Wars up 10 notches. I think because of this there will be some new fan share on the Force Awakens because the Internet loves picking apart things and jumping on bandwagons. Or not. But we'll see. TLDR; Force Awakens is a great movie that builds up an incredible world the Last Jedi can play in so well it will be a really great film. I think you can take Luke wanting the Jedi to end in a couple ways. Both are interesting and i'm not entire sure which it will be. 1. Luke actually wants to rid the galaxy of anyone with force ability. Let's face it, the Jedi are ultra powerful and it seems from the films having them around causes a huge amount of problems. Luke might believe that having such ultra powerful people might be too much for the galaxy and he wants to stop anyone from getting that power and using it for bad. This is a parallel between what Vader did, which was for entirely different reasons but the same kind of action. It would be an interesting juxtaposition and since, my guess, Luke is the most powerful person in the galaxy and seemingly for good but not it could create an interesting story. Further speculation on this line is that Luke might train Rey to help him take out the First Order and the Knights of Ren something she might like but Luke might take it too far for her or be too extreme? 2. Luke is speaking more metaphorically and he wants there to be less "evil extreme" Jedi and "good to the point of being dumb" Jedi. He thinks being Grey is actually better and will try and sway Kylo to the middle. I've only heard about the Grey path recently and it's an interesting concept outlined on Wookipedia below. "fan share" => "fan shade"
I'm thinking it'll be something along the second scenario, with Luke going Gray (or maybe going clear? Does he become a Scientologiat? ), but I'm hoping for something more out of left field. I'm still hoping Luke turns out to be Smoke lol. The first scene in the trailer, Rey falls and looks upset. Sure, this is probably part of a training montage, but maybe it's Luke throwing Rey out of his house/cace/dwelling. Or maybe Luke isn't Snoke, but Rey ends up turning evil. I'm throwing my bet behind a more Gray Jedi / balanced approach to the force. I love how the Star Wars trailers (at least for the main series) have been so good about making the movies look great without giving away the plot too much. So many trailers show you too much and then you already know what's going to happen by the time you see the movie. And man, I've watched this trailer like 12 times and I still get goosebumps when the red Star Wars logo shows up. And that end piece of music! John Williams is the man. I actually thought that was Darth Vaders burned helmet but it could be Kylo's which does make more sense. I think this trailer is one of the best trailers i've seen. Also, I like Luke as a Yoga Teacher. "Breeeeaaathe!" Where is C3PO and Chewbaca? Are they back? Looks like they are in the movie credits. There's no way they don't put threepio in it. Anthony Daniels has been in nearly every single Star Wars property and he's still kicking. If Anthony Daniels is alive in 20 years when Star Wars Episode 18 comes out and takes place 500 years in the future from Episode 8, Threepio will probably still be there. Jack and Rich (from Previously Recorded/RedLetterMedia) and Josh (frequent guest) play WWE 2K16 in a three-way brawl in The Battle of The Ladders. Jack and Josh have created characters that look like the two of them and Rich plays an actual character. It's stupid and hilarious. Enjoy! The CG Roundtable talked Chick Tracts first! We are the trendsetters! Thanks for sharing this it was really great. Didn't know he was such a RLM fan. 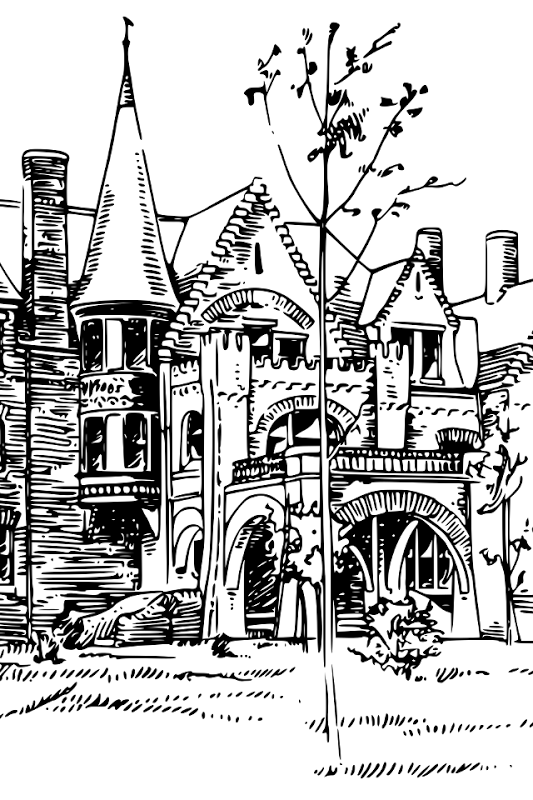 William Elshoff scoured the globe for artifacts of great power. His findings had turned up little until now, he claimed he had found the key to Nibiru! He locked himself in his study and began to work, he was in there for over a week! When we went to check on him, we discovered he had vanished. That’s why we have summoned you here. We are hoping, with your unique skill set, you and your team can unlock the secrets to Uncle William’s whereabouts and bring him home! 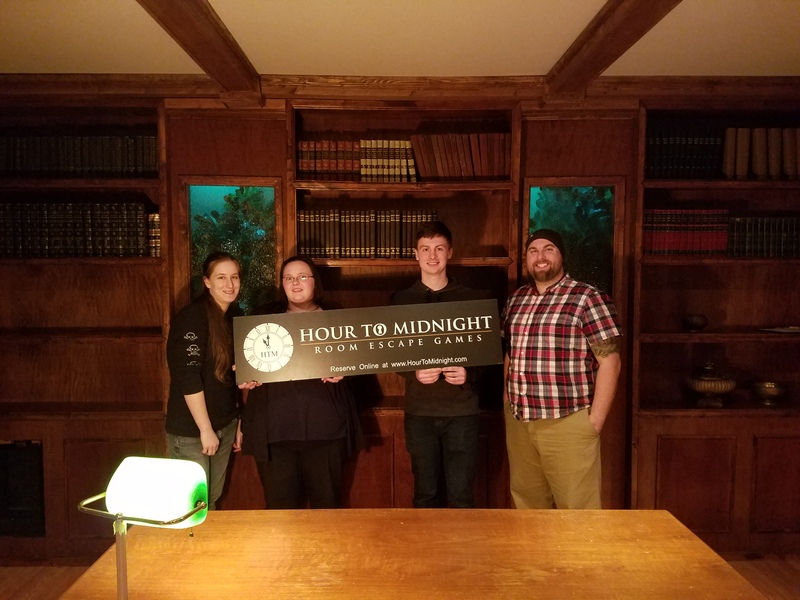 Last week, I received a review pass to Hour To Midnight - Room Escape Games to check out their first puzzle Room, titled The Secrets of Nibiru. I happily accepted it and joined a team of local “influencers” (2 people from hotels and 1 person who works in business networking) who were invited to promote Hour To Midnight. 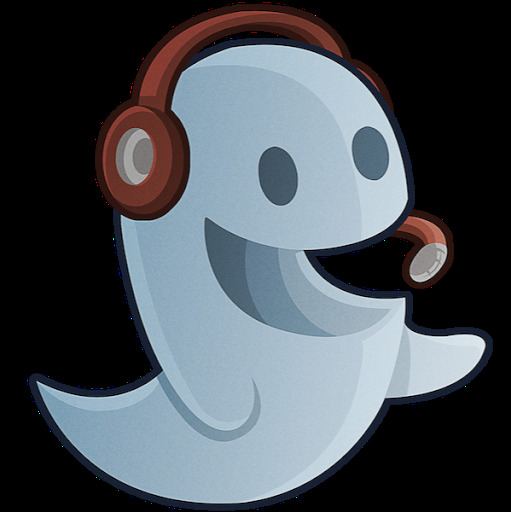 (Cheerful Ghost was contacted to try it out, as we’re a gaming website obviously. Jon couldn’t make it, but he offered the chance to me.) The recommended team size is between 6 and 10, so our team of 4 started out at a disadvantage, but HTM modified the game slightly for our team size (they have different rules for different sized teams). To begin, one of the HTM employees talked us through the rules and gave us some very general tips, as it was the first time in an Escape Room for any of us. Then we were walked into the room to start, and the door was shut behind us, locking (for legal and fire safety reasons, there’s a panic button to get out if needed). The lights were off and a short narration started, beginning the game. We then had 60 minutes to tear through the study and figure out how to get out. We started out slowly, just looking at everything, but soon started finding clues in random places around the office. I won’t go into any details about any of the puzzles, but sometimes simply just figuring out what the puzzle was was difficult enough! Everything was logical though and made sense within the room. Puzzles lead to more puzzles throughout. Sometimes, you’ll be working on one puzzle and concurrently someone else will be working on another that will help you along in yours when they’ve finished. I had an absolute blast! My team didn’t finish within the allotted time, but we got really close, and considering we were a small team of people that didn’t know each other, I was pretty proud of all we got through. Escape Rooms have been something I’ve been very interested in for a couple years now, but just never managed to try one out. Now that I’ve experienced it, I can’t recommend Hour To Midnight enough! Currently there’s only one room finished (this one took around 8 months to put together. The detail they went to is incredible. ), but they hope to have a second room finished by the end of the year. And have 2 more rooms in planning/building stages. Hour To Midnight also has a banquet room, where they can host receptions, office parties, etc. (I’ve already talked with my office manager at work about having an office outing here) When a large group is there, multiple teams can work through the room, and after your team has finished, you can spend your time in the “spoiler room,” where you can watch video feeds of the next teams struggle through the puzzles. I want to thank Hour To Midnight for inviting Cheerful Ghost to experience their business, and thank Jon for letting me go in his place. I absolutely recommend checking it out for yourself! This sounds truly awesome. I've played video games like this before, but doing it in person sounds even better! Another reason to move back to the northwest! Was there music playing in the room? Any other sort of atmospheric ambiance (beside the actual room, of course)? Hello, Tom here, one of the owners of Hour to Midnight. Yes there is music, it is low to allow you to concentrate on the puzzles. Though maybe we can turn it up a little. Thanks again Adam for stopping by and the wonderful words! Tom, you guys have done a great job! I can't wait to try out the next room! Here is a video that combines both the PRGE and his attempt to make a Nintendo PlayStation work. In the video, he runs into and interviews The 8-Bit Guy (https://www.youtube.com/user/adric22), Clint of Lazy Game Reviews (https://www.youtube.com/user/phreakindee), some guy named Metal Jesus (https://www.youtube.com/user/MetalJesusRocks) and Pat the NES Punk (https://www.youtube.com/user/PatTheNESpunk). Some guy named Metal Jesus? You don't know Jesus? Too bad him coming to our table wasn't in the video, it was a fun discussion. Hopefully we do more with VHS at the next expo. 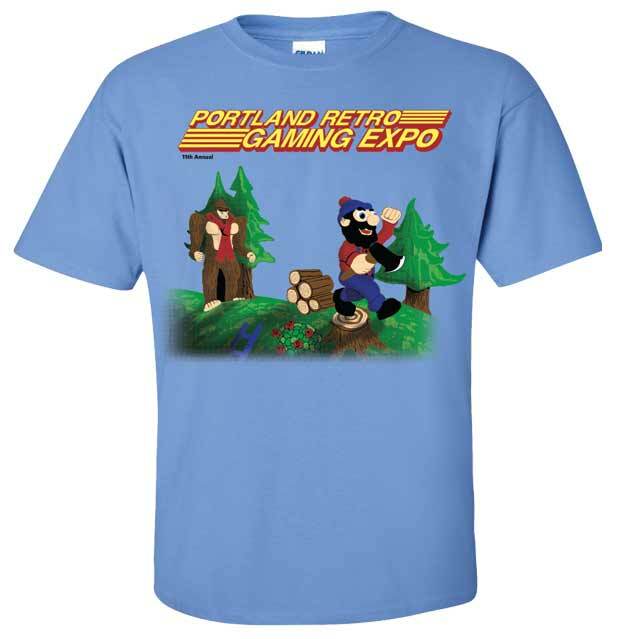 Today is Sunday and it's Day 2 of the Portland Retro Gaming Convention! Jon and I are manning the booth, talking to people and right now we have a speed running competition for Super Mario Bros 3! If you are at the convention come stop by!